2) Get moving...I avoid guilt at all costs. I know I'm going to eat WAY too much on Thanksgiving so if I can be active early before the actual feast I feel a bit less guilty when I eat my second dessert. Our city has a 5K race every Thanksgiving morning. It is also common protocol for the men (old and young) to gather for a Turkey Bowl. Turkey Bowl = Football played by very old and tired men who then complain all day and next that hey are SO sore. Super fun! ;) If running and football don't sound enticing, try going for a walk as a family or a bike ride. 3) 2 words, 5 syllables---Thanksgiving Charades...Nothing says Family Tradition like laughter and family-wide embarrassment. Acting out Thanksgiving words like Turkey, Indian, Pilgrim, Mayflower, Pumpkin Pie, Gobble, Blessings, etc....will make for lots of giggles and a chance for the kids to get out their wiggles (that rhymed ;) pre or post-dinner. 4) I wish I may, I wish I might...Drying the wishbone takes some times so this isn't technically going to happen ON Thanksgiving but it will still be something fun your kids look forward to. :) Who gets to pull the wishbone? Your family can decide...maybe the winner of the most Thanksgiving games (see posts below). 1) Are you Game?...Thanksgiving themed games. (We already mentioned Charades) My family LOVES Bingo. We play it for every holiday. The board changes based on which holiday we are celebrating. 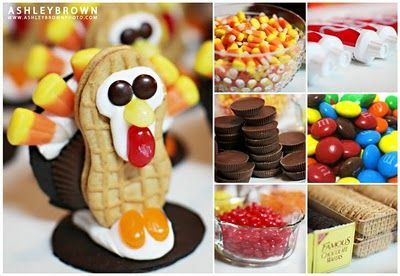 There are lots of printable Bingo boards ( lots of FREE options here) on the Internet and markers can be candy corns, or other thanksgiving candy. Pictionary is another game that is lots of fun, and super easy to adapt to holidays. Click here for a basic outline and some topic ideas. Board games are a big hit around here and they don't have to be themed. Our kids would love to sit and play a board game marathon. They love CLUE, Monopoly, Guess Who etc. Card games are also easy to play while food is cooking (or settling ;) Try this fun bowling game, for a less expensive version use, empty 2 liter bottles.